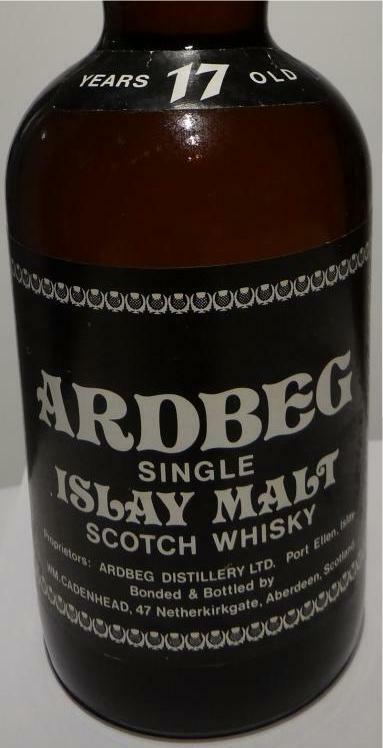 ...of this fine old style Ardbeg. It is not very powerful but its profile is delicate and complex and very quaffable. The peaty flavours are a little shy in the nose but bold on the palate and throughout the finish. I like it! The colour is very pale at white wine and the nose offers an adorable old style Ardbeggish profile with maritime peaty aromas over wet haystacks, sweet citric fruits, spices and some chalky-mineral notes. It is not very bold but delicate and perfectly balanced. No off-note that I can find - after some breathing fine oily aromas and a minor metallic note pops up (as so often with the Cadenhead dumpy bottles). The taste is much richer than the nose on stronger peaty flavours within a sweet fruity and sugary decoction. Actually, I associate the cooking of a citric marmelade on a peat bonfire which is very delicious. The spices are added last (ginger) together with some herbs. Water is not recommended because it just flattens the dram and turns it a little bitter. The initial mouthfeel is creamy but not very much coating with a minor drying metallic moment (that I like). The finish is medium to long and adds more spices (white peppers, ginger) while the fruits hold out until the very end. No distracting moments at all, and the peaty flavours are the last that vanish.